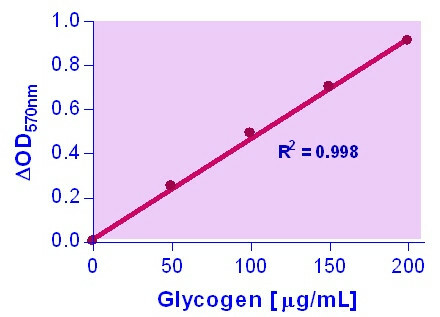 GLYCOGEN is a branched polysaccharide of glucose units linked by α-1,4 glycosidic bonds and α-1,6 glycosidic bonds. It is stored primarily in the liver and muscle, and forms an energy reserve that can be quickly mobilized to meet a sudden need for glucose. The most common glycogen metabolism disorder is found in diabetes, in which, due to abnormal amounts of insulin, liver glycogen can be abnormally accumulated or depleted. Genetic glycogen storage diseases have been associated with various inborn errors of metabolism caused by deficiencies of enzymes necessary for glycogen synthesis or breakdown. Simple, direct and automation-ready procedures for measuring glycogen concentrations find wide applications in research and drug discovery. 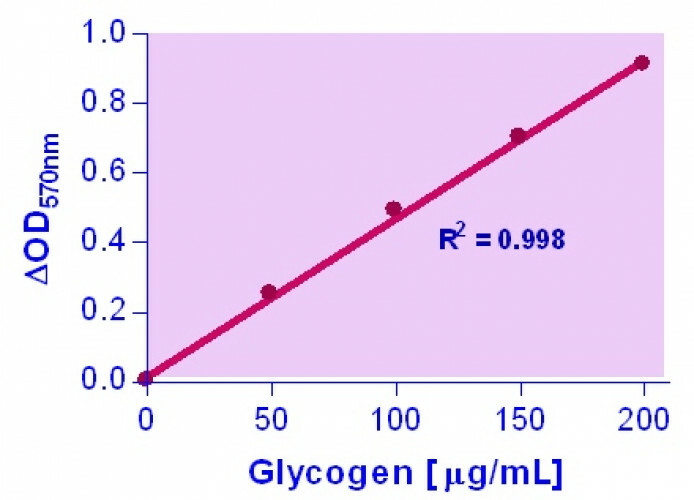 BioAssay Systems’ glycogen assay uses a single Working Reagent that combines the enzymatic break down of glycogen and the detection of glucose in one step. The color intensity of the reaction product at 570nm or fluorescence intensity at λex/em = 530/585 nm is directly proportional to the glycogen concentration in the sample. This simple convenient assay is carried out at room temperature and takes only 30 min. Applications For quantitative determination of glycogen and evaluation of drug effects on glycogen metabolism. References Assay: Glycogen in Rat Cardiac muscle (Pubmed).